iOS & web programming stuff. Streamlining lots of View Controller interactions with Swift enums. What ‘problem’ am I trying to solve? For example, take the Travelplanner screen of the Reisplanner Extra app I’m working on. As you can see, there are a lot of interactions (and there are actually even more interactions for different states of this screen), and all of these interactions need to be handled in code. In most cases you’ll end up with all kinds of different methods handling these cases, but over time it can start to become unclear where to look when something needs to be changed or added inside your View Controller. When a (new) team member has to work in the codebase that he has never touched before, it can take some time to find his/her way and know where to look. So how do I try to streamline this? Swift Enums, your best friend. Every interaction on the screen, triggers something, and I model all these interactions in a Swift enum called PerformAction . This enum is added as a nested type inside the TravelPlannerViewController, so you can reuse the same PerformAction enum name across your files without getting name collisions. If a new member starts reading through your codebase, he/she can check this enum and see at a glance what all the different actions are for this screen. To react on these interactions, we create a property performedActionand add a didSet property observer. Now you have 1 point of entry to handle all your interactions and call your methods. When using RxSwift I use a PublishSubject to keep track of changes. This is not a technique I use for a screen with only one or two actions. I tend to model it like this, if there are a lot of interactions. The downside is you’ll get a bit of extra code, because you proxy your interaction handling to the PerformAction enum. For newcomers (or your future-you) it will be easier to get around the code. Posted on October 19, 2017 Categories iOS, Swift, TutorialsTags enums, ios, software design, swiftLeave a comment on Streamlining lots of View Controller interactions with Swift enums. A few months back I published a blog post about how to integrate Unity3D within a native iOS application. This tutorial was written for Xcode 6 & Unity 4 and in the comments there were a lot of requests for a new tutorial. Tonight I found the time to make the video tutorial on how to integrate Unity 5 in a native iOS app with Xcode 7, so I hope you enjoy it! Apple added a touch-sensitive layer to the screen of the brand new iPhone 6s (plus). With the coming of this new screen, they’ve added some new UI interactions like application shortcuts and peek and pop. In this 3D touch peek and pop tutorial I will learn you how to implement this new way of interacting with your content by building a photo gallery. When you press hard on the screen you’ll see a preview of the image and if you press really hard the preview will pop into a detail view. At the end of this tutorial I’ll show you how to add preview actions. This way you can interact with the content without going to the detail view. You can do this by swiping up while you are previewing the content. A few years ago Apple introduced TouchID on the iPhone5S. Instead of asking your user for a password, you can just ask for their fingerprint (if their device has TouchID) which improves the UX by a gazillion times. With the introduction of iOS7, it was impossible for a developer to use the fingerprint sensor for authentication. Luckily in iOS8, Apple provided us with an API to do so. In this tutorial I’ll show you how you can integrate TouchID authentication in your application. With the introduction of the iPhone 6S (plus), Apple added a pressure-sensitive layer to their screen. This creates a bunch of new UX possibilities for creating apps. It’s possible to do a hard press on an application icon and get shortcuts which take you to a specific point in your app. 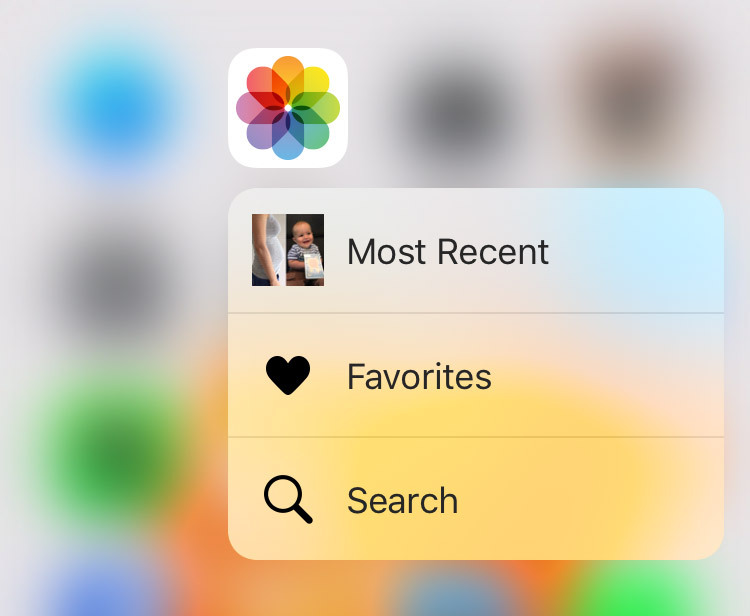 For example, if you do a hard-press on the Photo’s app icon you can quickly search for an image, check the most recent images or see your favourites. It’s also possible to make these quick actions dynamic, meaning that you can add and remove actions based on the state of your application. In this tutorial I will show you how you can add these quick actions to your application icon. Update: I’ve created a new tutorial for Xcode 7 & Unity 5. Last year I published a blog post about how to integrate Unity3D within a native iOS application. Last week I found a better way to integrate Unity3D within a native iOS app, which also eliminates some issues with my previous version. Because it’s quite a long explanation to do and I noticed in my previous blog post that not everything was crystal clear, I’ve made a video tutorial how you can achieve this. Yesterday I stumbled upon a problem when I loaded a xib file within my development pod. I started looking a possible 3D engines which I could use like Unity, but then I remembered Apple has released the SceneKit SDK which allows pretty high-level access, but with excellent performance. Everytime when Apple releases new software, I can’t help it to format my computer. I just don’t seem to trust an update of a operating system. I like to create a bootable USB drive because it’s blazing fast to install an OS. For Yosemite, it took me +- 15 minutes with a USB3 stick. Luckily it is fairly easy to create a bootable USB drive for OSX 10.10 Yosemite! I HAVE CREATED A NEW WAY TO INTEGRATE UNITY WITHIN AN EXISTING IOS APP. YOU CAN FIND THE POST HERE. After my previous blog post on how to sandbox an iOS app inside of a Unity project, I got some questions on how to do the same but put Unity inside of an existing iOS app. After playing around with it, I found a solution which works well for me to add Unity app in an existing iOS app. Proudly powered by WordPress Theme: Twenty Fifteen Child.